It's all about supply and demand when a high school deals with the sudden exodus of male students.The boy recession has hit Julius P. Heil High, and the remaining boys find that their stock is on the rise: With little competition, even the most unlikely guys have a good chance at making the team and getting the girl. Guitar-strumming, class-skipping Hunter Fahrenbach never wanted to be a hot commodity, but the popular girls can't help but notice his unconventional good looks. 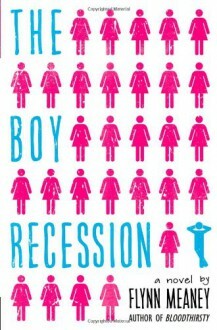 With a little work, he might even by boyfriend material.But for down-to-earth Kelly Robbins, the boy recession is causing all sorts of problems. She has secretly liked her good friend Hunter for a while now, but how can she stand out in a crowd of overzealous Spandexers?As if dating wasn't hard enough without a four-to-one ratio!